Lake Country - Hi-Gloss CCS Final Finishing Pad 5.5"
Lake Country Hi-Gloss CCS Final Finishing Pad 5.5"
Constant Pressure Technology helps ensure uniform results with your polisher. Lake Country Constant Pressure Technology CCS Pads incorporate CCS Technology and Constant Pressure Technology to create smooth, uniform results. This red pad has no cutting or cleaning action. This new, incredibly fine pad for applying the final liquid wax or paint sealant. While made for the OEM market and demanding enthusiast, this easy-to-use, Hi-Gloss Red Finishing Pad glides over the surface creating a mirror-like shine. Constant Pressure foam. The blue foam layer on each pad is specially designed to absorb off-axis movements of the polisher to allow the pad to maintain constant pressure on the paint. If you tilt your polisher slightly, the pad adjusts to spread the uneven pressure evenly over the whole pad. The blue layer of each pad is made of instant rebound foam. The blue Constant Pressure foam is behind the work surface foam, so it doesn't affect the cut of the pad. CCS foam. 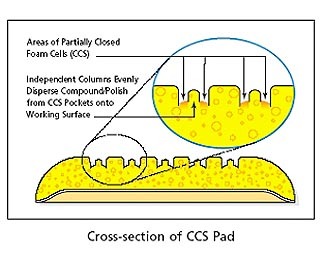 The Constant Pressure CCS Pads are designed to prolong your polishing time and reduce product waste. On any foam pads, the foam gradually absorbs the product. These cells slow the rate of polish absorption, gradually releasing polish as needed by the operator. CCS pockets reduce surface tension, prevent pad skipping and allow the operator to run the pad flat on the working surface. Curved outer edge. The edge of each pad is rounded which allows easy transitions over seams and inclines of vehicles without snagging. If you tilt the polisher, you'll touch the paint with a gentle curved edge as opposed to a blunt edge. The curved edge helps prevent marring on curves and concave panels. Recessed hook and loop backing. Many pads feature hook and loop fasteners from edge to edge to ensure a secure hold. On Constant Pressure Pads, the backing material is 3/8 inch from the edge of the pad. The hook and loop fastener material is coarse and could mar the paint if the user cuts in too close by a vertical panel. For less experienced users, the recessed hook and loop backing is an added safety measure to prevent scratching. Choose from many different foam compositions to get the desired results. Lake Country manufactures some of the industry's finest foams. To use the Lake Country Constant Pressure Technology 5.5 Inch Pads, you will need a 5 Inch Dual Action Flexible Backing Plate for dual action polishers or a 4 3/4 Inch Rotary Backing Plate.. Description Constant Pressure Technology helps ensure uniform results with your polisher. Lake Country Constant Pressure Technology CCS Pads incorporate CCS Technology and Constant Pressure Technology to create smooth, uniform results. This red pad has no cutting or cleaning action. This new, incredibly fine pad for applying the final liquid wax or paint sealant. While made for the OEM market and demanding enthusiast, this easy-to-use, Hi-Gloss Red Finishing Pad glides over the surface creating a mirror-like shine. Lake Country Constant Pressure Technology CCS Pads have these benefits: Constant Pressure foam. The blue foam layer on each pad is specially designed to absorb off-axis movements of the polisher to allow the pad to maintain constant pressure on the paint. 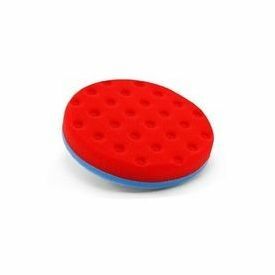 If you tilt your polisher slightly, the pad adjusts to spread the uneven pressure evenly over the whole pad. The blue layer of each pad is made of instant rebound foam. The blue Constant Pressure foam is behind the work surface foam, so it doesn't affect the cut of the pad. CCS foam. The Constant Pressure CCS Pads are designed to prolong your polishing time and reduce product waste. On any foam pads, the foam gradually absorbs the product. These cells slow the rate of polish absorption, gradually releasing polish as needed by the operator. CCS pockets reduce surface tension, prevent pad skipping and allow the operator to run the pad flat on the working surface. Curved outer edge. The edge of each pad is rounded which allows easy transitions over seams and inclines of vehicles without snagging. If you tilt the polisher, you'll touch the paint with a gentle curved edge as opposed to a blunt edge. The curved edge helps prevent marring on curves and concave panels. Recessed hook and loop backing. Many pads feature hook and loop fasteners from edge to edge to ensure a secure hold. On Constant Pressure Pads, the backing material is 3/8 inch from the edge of the pad. The hook and loop fastener material is coarse and could mar the paint if the user cuts in too close by a vertical panel. For less experienced users, the recessed hook and loop backing is an added safety measure to prevent scratching. Choose from many different foam compositions to get the desired results. Lake Country manufactures some of the industry's finest foams. To use the Lake Country Constant Pressure Technology 5.5 Inch Pads, you will need a 5 Inch Dual Action Flexible Backing Plate for dual action polishers or a 4 3/4 Inch Rotary Backing Plate..